Thanks, Carrie. It is quite comical. It's not done yet though. My July goal was to get the blocks done. Now to get them sewn together and add borders. Probably not in August since I have some other urgent sewing to complete. Good luck on your project for your dad. 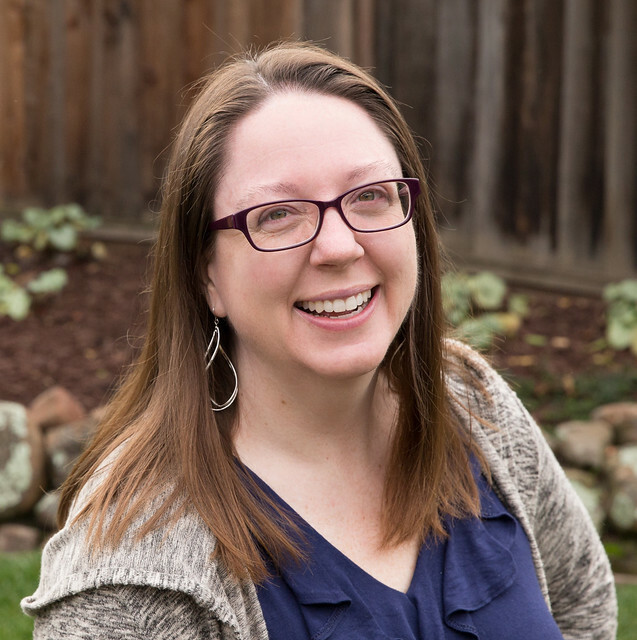 Is a long arm quilter an option? Great quilt! Congratulations on finishing!!! Thank you, Melissa. It feels good. Thanks for the inspiration. 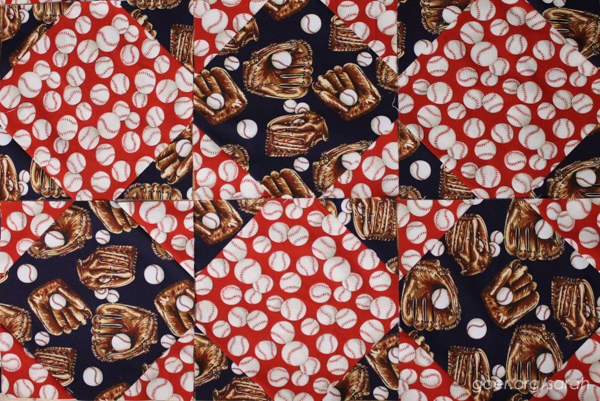 Truly a pitcher's dream quilt, or a batter's, but maybe a catcher's nightmare! 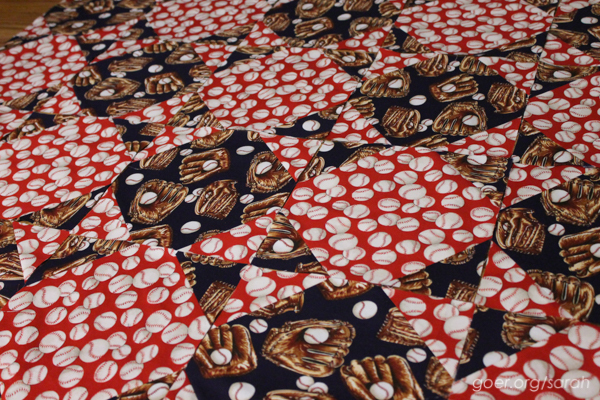 Anyway a perfect one to have quilted by another since the fabric pattern won't really let your quilting be the all-star! Although the reverse could be very interesting in a solid with the quilting as texture. I'm sure your long tall brother will enjoy many cozy hours under it. A gift of love. A solid on the back is a great idea. :-) Thanks for visiting, Marji. I do love the way you sometimes integrate a stripe of contrasting fabric on the back. How wonderful to have 'grasped the nettle' of an old wip and pushed it through to the final stages. Funny how our tastes change over time and with experience! Let's be real. He might just roll his eyes at me for taking ELEVEN years to finish it. :-) Ha ha. Thanks for visiting, Bo. Congratulations on making progress. Good call on sending it out for quilting. Thanks, Anja. 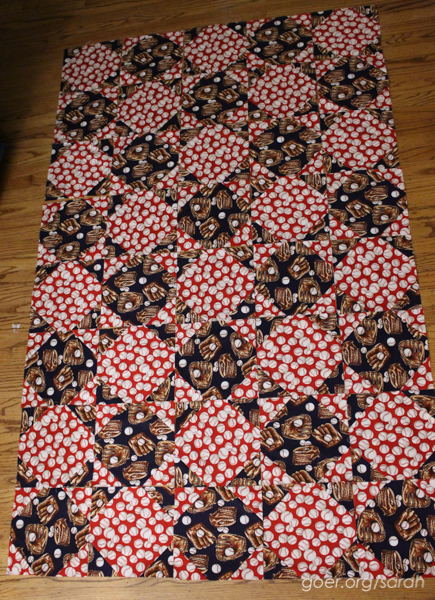 Now to keep up that momentum to finish piecing the top. I have a long suffering WIP but not that old. It's hard to make quilts for other people. My WIP was supposed to be a quilt for my father but I'm going to tie it and give it to a local charity. I think clearing that from my to do list will lift a burden from me. I hope using a long arm quilter will give you that weightless feeling as well. I suspect it will. Good luck finishing up your quilt. I'm sure the charity will be thrilled to receive it. :-) Thanks for visiting, Wanda.